South Korean parts manufacturer LG Innotek has mass-produced compact refrigerators with thermoelectric modules, the firm said Monday. According to LG Innotek, the recently launched table-sized refrigerator LG Objet has been incorporated with thermoelectric modules. These modules are combined with the components of thermoelements, radiator panels and radiating fans, to replace the cooling compressor system. 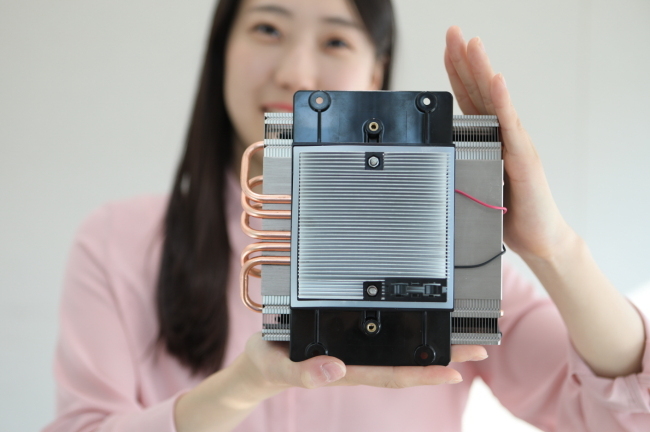 By using thermoelectric semiconductor technology, the cooling function has been upgraded, according to the firm, as it is able to bring the temperature to as low as 3 degrees Celsius compared to other small-sized refrigerators that can go down to 8 C at the lowest. The modules are palm-sized to keep the refrigerator compact, and minimize noise and vibration. The refrigerators are particularly suitable to be used as mini-bars at hotels, it said. The company said it plans to apply the technology to other fields including wearable devices, vehicles and telecommunications. “The thermoelectric semiconductor is an innovative technology that can make our lives more environment friendly and convenient. We will actively engage in talks with experts from various fields to expand usage and develop the technology,” said LG Innotek CTO Kwon Il-gun. According to market researcher TechNavio, the global thermoelectric semiconductor market was valued at $471 million as of last year and is expected to grow to $626 million by 2020.